Ahhh, October……the last of the late summer storms leaves the air clear and crisp with blue skies and orange trees. Evening comes early now revealing the bright constellations of the fall sky. At the top of the sky are two bright stars, Vega of Lyra and Deneb of Cgynus. The stars of Cygnus do double-duty as an asterism – that is, the stars represent two shapes at one time. Looking at the stars one way we see the long neck and outstretched wings of a large billed bird, a swan, flying south along the Milky Way. Deneb, 1,550 light years away, is the tail of Cygnus, while the lovely double star Albireo is the bill of the swan. If you look another way, the stars form a large cross. Deneb is the top of the cross, Albireo marks the bottom. Interestingly, as Cygnus rises in the late spring, the swan is flying upward across the sky and the cross is inverted. As we move toward Winter, the swan will point bill-down in the west, while the cross will stand upright. Vega, westward from Deneb, is the brightest star of the star group Lyra the Lyre and is 26 light years away. Both Lyra and Cygnus are ancient star groups known from ancient Greek mythology 2500 years ago. The reddish star flickering low in the west right after sunset is Arcturus, the red giant star. Its distance is estimated to be 37 light years. Another asterism doing double-duty this season is Pegasus. Its stars map out the body of a horse and also give a ‘tip of the hat’ to the baseball playoff season – they double as a baseball diamond! To find it, look to the east for a big square around 8 p.m. - its corners are marked by bright stars. Each star is a base on the diamond. You’ll find home plate (the 'top' star of the square), first and second base, the shortstop playing ‘in’ a bit, and third base. The pitchers’ mound is there, as is the home plate ump and over by the third base line, that ump is arguing with the manager! Under dark, clear skies, and with binoculars, the Andromeda Galaxy can be seen not far from the Square of Pegasus. Andromeda is a spiral galaxy much like our Milky Way but is the most distant object visible to the naked eye - 2.9 million light years away. 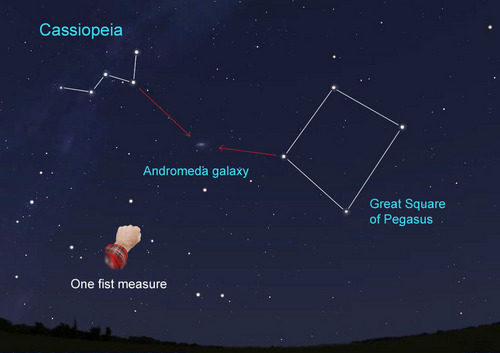 When we look at Andromeda, we see the light that left it almost 3 million years ago. It contains some 300 billion stars and who knows how many planets! Around in the north, the big bear of the sky Ursa Major now walks the northern horizon. Along the northern horizon to the east, the bright twinker low on the horizon is Capella, brightest star of the winter group, Auriga the Charioteer. The other winter notables Perseus, Taurus, Orion, and Gemini fill the east after midnight. As the early October evenings begin, six planets are stretched across the sky at 7 p.m. Starting lowest in the west, Venus is all but buried in the glare of the setting sun. Higher above the horizon Mars fights to be seen as well. Our largest planet, Jupiter, is bright and easy to spot in the southeast as the sky darkens. Just to the east of Jupiter Uranus sits quietly, difficult to see without a telescope. Thirty degrees to the west is our most distant planet, Neptune. Even a small telescope under dark, clear skies will reveal their dim disks. Farther west and above the stars of Sagittarius, we find one of our system’s larger dwarf planets, Pluto. Visible only under the darkest skies and with the largest telescopes, Pluto (like Uranus and Neptune) is unremarkable visually because of its tiny size and incredible distance. It reflects very little sunlight.